It’s been three years since I last reviewed a power generating set. Viz; Harbor Freight Storm Cat 800w/900W portable generator. Funny enough, the gen still works till date. Going forward from then, I’ve used a 2.8kVA Tiger generator and was supposed to choose between Sumec Firman and Haier Thermocool generators for this recent buy, but was somehow caught with Lutian instead. My decision to go for Lutian gasoline power generating set was hugely influenced by Konga‘s nation-wide free delivery eShopping bonanza. I was able to save some bucks on it, as the want for a gen-set was just a side attraction and never atop my scale of preference. So, this review is coming just after a month of active usage. I’ll update the page as soon as there’s new issues, solid assertions, recommended maintenance advice and etc. Lutian, just like Elepaq and Elepon power generating set are new to the African market and trying to gain some level of acceptance by high-bough companies and/or major industries. They’re imported from China and comes with some level of guarantee as their fake replicate model isn’t infiltrated the Nigerian market yet. Lutian Machinery Co.,Ltd, though newly introduced to the Nigerian populace has been in machinery production business for more than a decade, and has shipped various power generating sets to several countries of the world. In this first review of a Lutian-produced power generating set by 3ptechies, We’re going detail our view on their products, our personal experience and possible recommendation for early adopters. 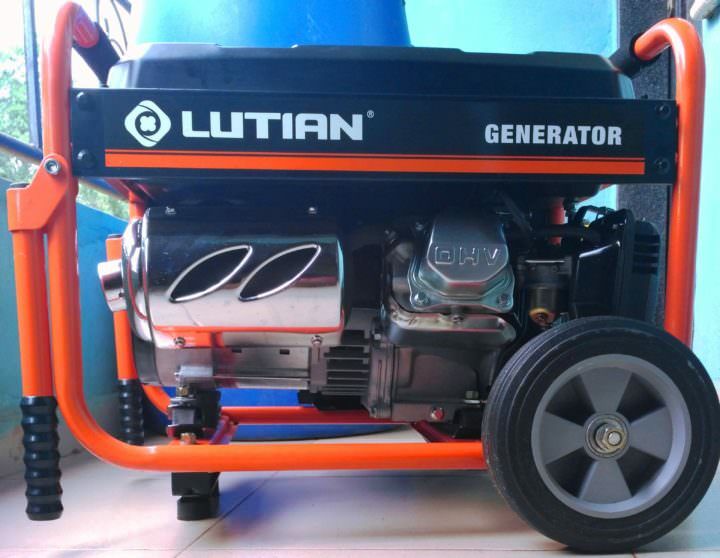 Lutian LT3900E gasoline generator is an R classified (220V 50Hz), 100% copper made, air-cooled, 3.5kVA rated power generating set from Lutian Machinery Co., Ltd. It features an electronic key starter for simple, quick-starting , a high quality automatic voltage regulator (AVR) for the safe-running of voltage sensitive electronic equipment and an oil alert system that indicates low oil levels by triggering an automatic switch off (of the machine) to protect the engine. Other intriguing features that’s shipped with this power generating set includes: an easy-to-read display unit that indicates volt/amp meter, running frequency, and an automatic circuit breaker that shuts down the generator in critical situations such as over-load, bad connections, malfunctioning equipment and etc. Lutian LT3900E 3.8kVA generator also features: a Pilot Lamp function that indicates the proper working of the machine and a Fuel sediment cup that stops dirt and/or water molecules from getting into the carburetor from the fuel tank. There is also the 12V/8.3A D.C output unit that comes in handy for the charging of car and/or inverter batteries. As usual with most consumer generators, it is equipped with a rope-pull mechanism (Recoil) for starting the power generating set manually. There is two wheels also for balance and quick movement of Lutian LT3900 generator from one point to another. Here’s the technical specifications for the LT3900E model of Lutian standard gasoline power generating set with electronic key starter. 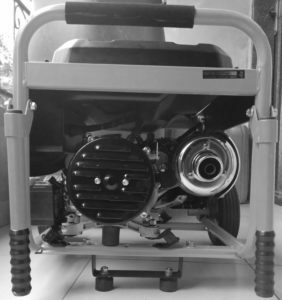 Engine Type: 4-Stroke, Air Cooled, Single Cylinder Engine. Alternator Type: 2-pole, Brushless, synchronous, self exciting, 100% Copper Enameled Wire. Engine Starting System: Electronic Key Start plus Recoil (Manual Rope-pull Start). Other Features: pilot lamp, built-in automatic voltage regulator (AVR), oil alert system and circuit breaker. As usual with our reviews, unboxing or in-the-box section is normally discussed, but for a large machine as this, we’ll look beyond unboxing to discuss about the requirements for best performance. While coupling, the most difficult section we met was fixing the battery unit as there isn’t a credible screw-base unit built for it. We managed to firmly fasten the battery base with a single bolt, nut and washer. Another basic need was the use of SAE 10W-30 (or 5W-30) 4-stroke premium quality engine oil that’s certified to completely meet or exceed the U.S. automobile manufacturer’s requirements for service classification (SF/CC, SG, CD). We found one that’s produced by Pertamina and retails for about ₦12,000 ($35) per 5 liters storage can. Lifted the machine sideways to fill to gauge. We used the manual rope-pull starter for first use as the battery unit shipped with it was completely down. Our overall first impression was positive as the noise-level wasn’t as loud as our previous machine. We decided to check the noise performance of Lutian LT3900E 3.5kVA rated gasoline generator on no-load vs load vs heavy-load basis. The test was carried out at distance of 0.5 Meters or thereabout and published at YouTube. You can watch the full video below and drop your opinion in the comments section. Note that the video capture position can influence the noise-level as being in the exact direction of the exhaust pipe would normally output a louder noise than when standing by the side. Since Lutian is a budget brand when compared with Sumec Firman, Honda and Haier Thermocool counterparts; we’ll advice you run it below its rated power output. We strongly discourage against operating above the rated power or ever exceeding the maximum power. The use of manufacturer’s recommended engine oil (SAE 10W-30 viscosity motor oil) is highly advised and users should never ignore the maintenance schedule specified in the generator’s user manual. Finally we strongly recommend you use one heavy load at a time as models like Lutian has not been tested to limits by independent tech reviewers. Following this template will ensure longevity and prevention of frequent wear and tear on this unit. While major distributors can place bulk orders for Lutian petrol generators from their official website at chinalutian.com, direct consumers can shop directly from tech stores around. It retails for a price between ₦72,000 and ₦82,000 on Konga, Jumia and few other online shopping malls. Port Harcourt shoppers can buy from the tech stores beside callus miller, 2nd artillery, Port Harcourt, R/S. 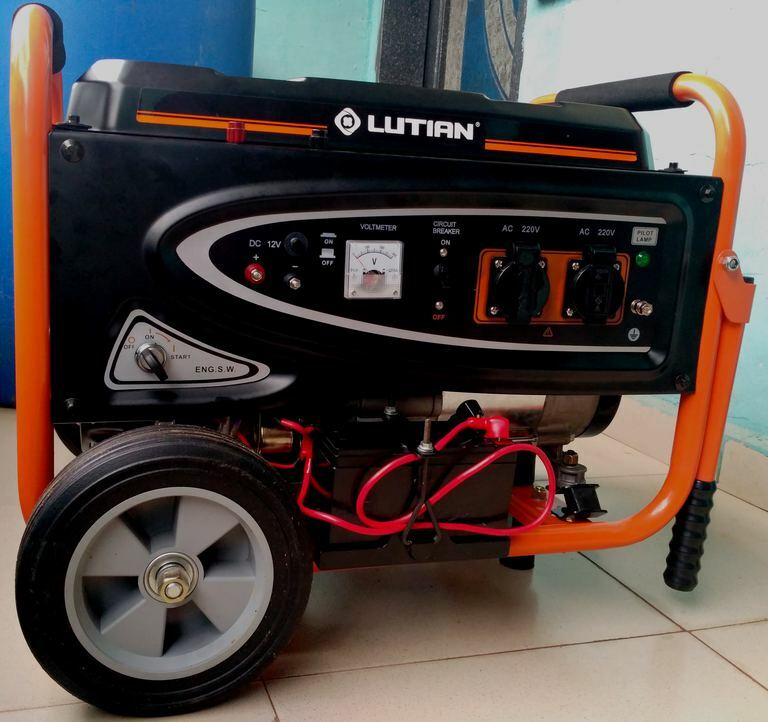 After our first impression (discussed above), we went on to test this unit with some household appliances connected and was satisfied with the overall price Vs features performance of Lutian LT3900 gasoline generator. It conveniently powered our Polystar 1.5hp (housepower) floor standing mobile air conditioner (AC) unit, Haier Thermocool 180 Liters double-door refrigerator (HRF180EX), Philips pressing iron, Midea micro-wave oven and few other heavy items all tested at “1-at-a-time” basics. Xiaomi Mi Robot Vacuum Cleaner Review 2019: is it any better? With this, it will be proper to assert that Lutian LT3900 petrol generator can conveniently and effectively power electric loads not exceeding 3.5kVA. While we are highly impressed with the oil alert system that steadily monitors the oil-level in the generator’s crankcase and automatically shut down the engine if or when the oil-level falls below safe limits, we are somehow disappointed with the positioning of the oil filler, as it makes it hard to refill oil conveniently without a long (or special trunk) funnel. Another ill-feature of this unit is the air cleaner’s waste hole that stains the floor with excess oil released. A tiny container holder underneath the hole would have done a better job by holding the excess oil until they’re cleaned up with a towel or rag. In all, the price Vs features ability of this model is great and can come in handy for those on budget. Other-wise Honda, Sumec Firman and Haier Thermocool generators gives more value for money. The battery base is designed to fit beside the alternator. You will have to completely remove (or cut off) that black stud under the alternator to fit in the battery properly. It was installed to protect the alternator during shipping. Just slide in the base and you will see the matching holes. The bolts and nuts are in the box. Great overall price Vs features value. This is unit is SON approved. Low-noise is an added advantage. We love the electronic key starter & the other enhancement features. Could improve on the air cleaner’s waste hole part. Could do better with a standard two-screw base unit for the battery. A less-complicated user-manual for each model would be more useful. Could improve on the oil filler positioning. I have been using the generator for over three months and here are my observations. Sometimes the gen goes off upon loading and my battery has gone bad.The battery failed to start after the fuel finished from the generator. Do you have an idea how much a new battery goes for? Before going for a new battery, have you tried taking the battery to road-side battery chargers? The original one is a little bit less than 5k, while Chinese ones are sold for 3k5 or thereabout. 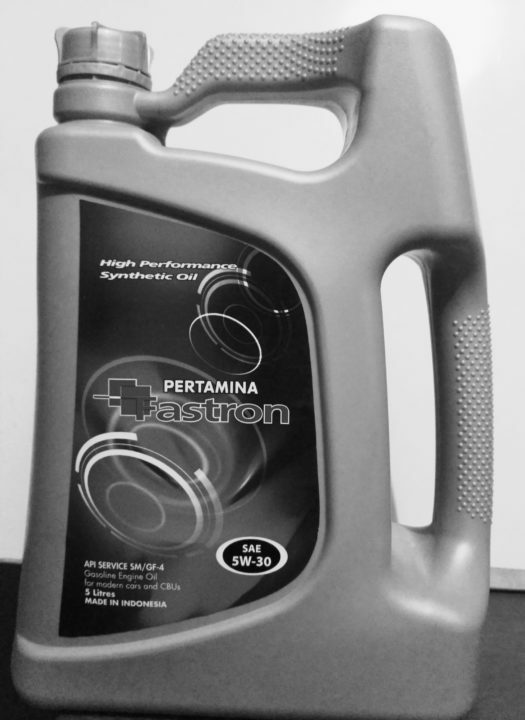 Where should I get the pertamina engine oil. The battery base was actually designed to fit beside the alternator. You will have to remove(cut off) that black stud under the alternator, it was installed to protect the alternator during shipping. Just slide in the base and you will see the matching holes. The bolts and nuts are in the box. Thanks for your valuable contribution. We really appreciate this, but would have been happier if proper details for this was provided in the user manual. I’m thinking towards that Ezra. Will add it when next I’m updating the content. Thanks so much for the wonderful work you’re doing here and thanks for this review. Now I need a generator set for my newly opened business centre. I’m using two computers and two photocopying machines. The price of sumec Firman is too high. I’m on a tight budget. So please, what’s the latest price of this Lutian ? Where can I get it now? Will it serve my purpose? Are the spare parts readily available? The spare part aren’t different from what’s obtainable with other products, so it’s readily available and you can buy from any of Jumia or Konga as shown in the Pricing and Availability section of this review. The current price ranges from 80 to 85K depending on the store. Hey there. What is the fuel consumption rate? Can a liter last 2hrs assuming the gen powers a 200l fridge, fan, laptop and 3 bulbs? Thank you? If it cannot last 2hrs which gen can you recommend to power a microwave with about 2hrs/liter consumption rate? The fuel consumption rate is good, but I haven’t done the exact test you spelt out in your comment. Like – putting a liter of fuel just to check how much time it’d take to deplete completely. I have a lutian 3.5kva generator. Very very reliable. Never taken it out for over a year and 5 months now. But lately it started going off at will. The engine would still be on but the pilot lamp will go off. After a while it comes back on. If you turn it off and it cools and its turned on. It stays and goes off again after 1hr of runtime. I do not want to give it to any road side mechanic before they damage my precious engine. Have you done comprehensive maintenance on it recently? I mean the ones that are recommended in the manual like; cleaning the air filter, oil change, etc.? That should be the point to start your troubleshooting from as it looks like a minor maintenance bug. 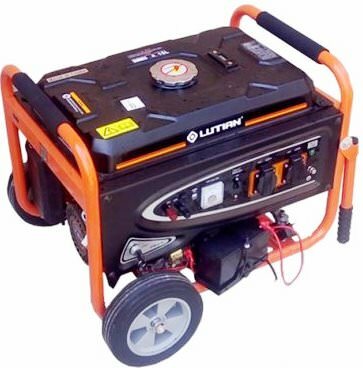 Pls where is lutian generator warehouse situated in Lagos and the ones sold on jumia how reliable is it cos I know jumia is full of refurbishment. It should, assuming there are no other loads connected to the generator.